Poor Xherdan Shaqiri. Bet he was dying for a start this afternoon! Fulham make four changes. Ryan Sessegnon is again on the bench. Liverpool make two changes. Fabinho and Adam Lallana come in for Jordan Henderson and James Milner. Poor Fulham. Like Huddersfield, it would take a miracle for them to avoid relegation this season. They were at least saved the blushes of dropping to the bottom thanks to West Ham’s dramatic comeback over the Terriers yesterday. If they are to stay up, they need to win every game between now and the end of the season and hope their rivals drop points. It’s as simple as that. Lee: We can still win the league, it’s not over. People forget City play 5 away and 3 at home. Win today and there are only 3 away games left for us. Tunde: 1. Liverpool (because I’m a Liverpool fan and hoping City slumber a bit) 2. Man City 3. Arsenal and 4. Chelsea . Just a strange feeling that Tottenham might slip off. Everton midfielder Andre Gomes takes part in a ‘hug-a-thon’ to help raise money for The People’s Place charity, part of Everton in the Community’s mental health programme. Chelsea have been in Europa League action this week, which won’t help their energy levels but they will be full of confidence after thrashing Dynamo Kiev and I don’t see them leaving Goodison Park empty handed. Get the pints of Guinness out! Wayne Rooney. Remember him? Well, England’s all-time leading international goalscorer did what he does best yesterday and scored his first Major League Soccer hat-trick as DC United thrashed Real Salt Lake 5-0. Bradley: Got to throw the kitchen sink at Fulham and everyone else till the footballing season ends. Old big ears and the Premier League title may arrive after all. Naby Keita will be assessed after missing the trip to Germany with a minor injury. All the focus remains on the top of the Premier League table where Liverpool are hoping to win their first league title in 29 years. They can return to the top of the table with victory over Fulham this afternoon, with Manchester City still to play a game in hand. Chelsea are also fighting for a place in the top four – and securing a spot in next season’s Champions League – and could move level on points with Arsenal with a win today. Everton, currently sat in 12th, will still be out of the top 10 whatever the result. It’s prediction time. Can Liverpool win the title and will Chelsea finish in the top four? Send in your predictions on what you think the league table will look like after eight more games. There were late goals and drama in abundance in Saturday’s three Premier League matches. To read about the other two games, click here. There’s another FA Cup quarter-final happening early this afternoon and you can follow that match between Millwall and Brighton with Matt Henry’s live text – that kicks off around 12:45 GMT. But I’m focusing on today’s two Premier League games. And they’re biggies! 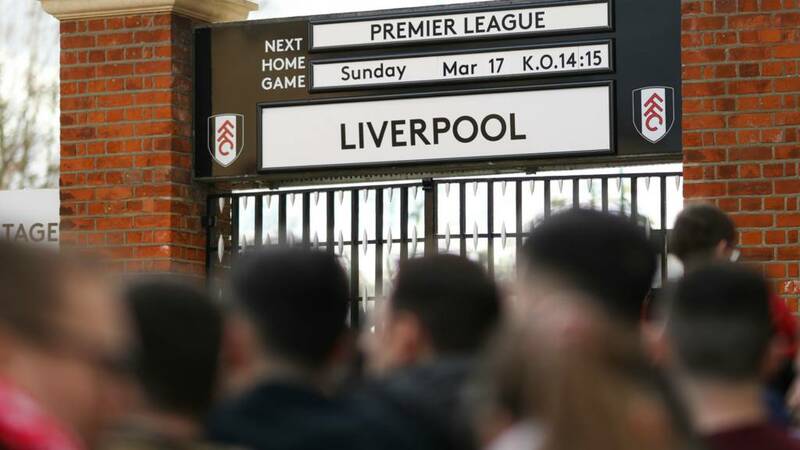 Liverpool could return to the top of the table with victory over Fulham, while Chelsea are still battling for that top four spot with Arsenal and Manchester United. Fulham are playing for pride. Liverpool are playing for the Premier League title. And Chelsea want a place in the top four.